“The late Cpl Rowland George Shephard, son of the late Herbert Shephard of Inglenook, Westminster Road was born on July 23rd 1896. He attended the Wyche Schools till he was 12 years of age, and during that period gained two silver medals for perfect regularity of attendance. He afterwards entered the Lyttelton Grammar School, where he gained several distinctions, and where he remained till he was 15. On leaving school he was apprenticed to Mr H Williams, outfitter of York House and the day is indentures expired he enlisted in the Seaforth Highlanders and of the 4th March 1915 joined the Colours at Cromarty. “As soon as he could read he became a member of the choir off All Saints Church, the Wyche joining his father and three other brothers there. He was always a most enthusiastic Scout and after gaining every single available badge in the 1st Malvern Troop, he became a patrol leader and was made a King’s Scout at Windsor in 1912. He was more than usually gifted and very artistic. At the Scout’s Exhibition and Universal Rally held at Birmingham in 1913, one of the most striking exhibits was a large illuminating Chart of the Scouts Law, beautifully executed by King’s Scout Rowland Shephard, for which he was awarded a special diploma by the Chief Scout, General Sir R Baden-Powell, and in a subsequent exhibition he distinguished himself in several boxing competitions and as a good all-round gymnast and swimmer. In all his career he was closely emulated by his brother Claude who was made a King’s Scout and with his brother attended the Royal Rally at Windsor; in fact the two brothers were almost inseparable. “With his thorough training as a scout, it is not surprising that he was made a Lance Corporal of the Seaforth Highlanders within a few weeks of joining the regiment. After being at Cromarty for about four months he was sent to join a battalion in France and took part in many famous actions. 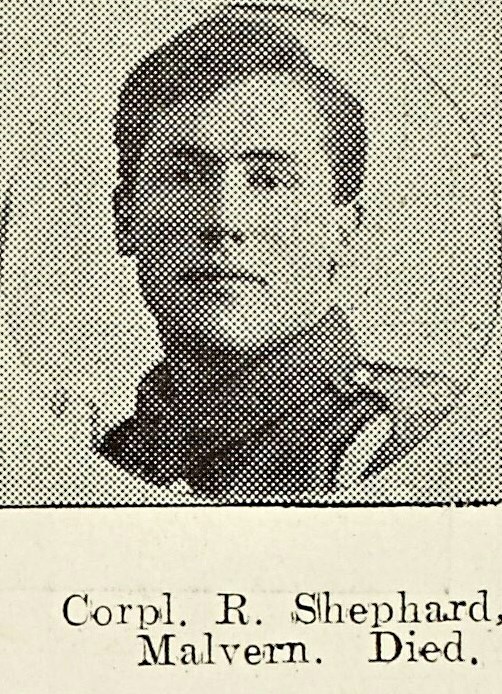 When the importance of the machine gun was recognised, L/Cpl Shephard was transferred to the Machine Gun Corps, and attained the rank of Corporal and took part in many engagements on the Somme and elsewhere.